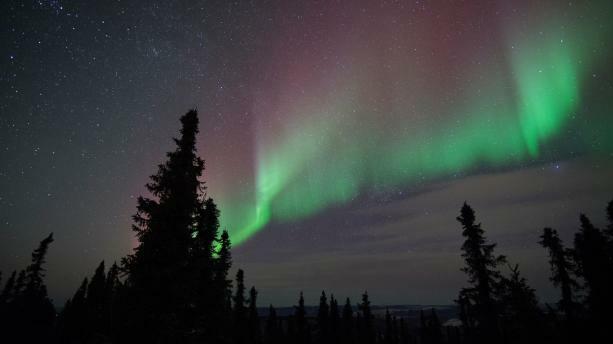 The Aurora Tracker correlates three individual streams of data in order to predict northern lights viewing opportunities for six locations in the Fairbanks region. Switch between viewing locations, different days and various times of day to check your viewing chances. Check back often as this data changes frequently. A favorite in-town location, Creamer&apos;s Field Migratory Waterfowl Refuge is 2,200-acre/8.9 km and is located 2 miles/3 km from Downtown Fairbanks. Creamers offers wide open fields and wooded trails easily accessible on a well-maintained, paved road. Cleary Summit has an elevation of 2,233 ft/680 m and is located 20 miles/32 km from Fairbanks. It is a popular viewing area with multiple pull-outs. It is accessible but there are some very sharp turns and major elevation changes and in snowy conditions, an all-wheel or 4-wheel drive vehicle is recommended. The Chena River State Recreation Area is accessed via Chena Hot Springs Road which starts 4 miles/6 km from Fairbanks and traverses 58 miles/93 km ending at Chena Hot Springs Resort. The area is generally accessible for 2-wheel drive vehicles but all-wheel or 4-wheel drive vehicles are recommended especially in snowy conditions. Visitors should exercise caution as cell service can be spotty and moose are often in the area. Chena Lake Recreation Area is a 2,000-acre/8 km2 park located 17 miles/27 km from Fairbanks, just outside of the city of North Pole. The area offers lakes and trails easily accessible via well-maintained paved and gravel and dirt roads. 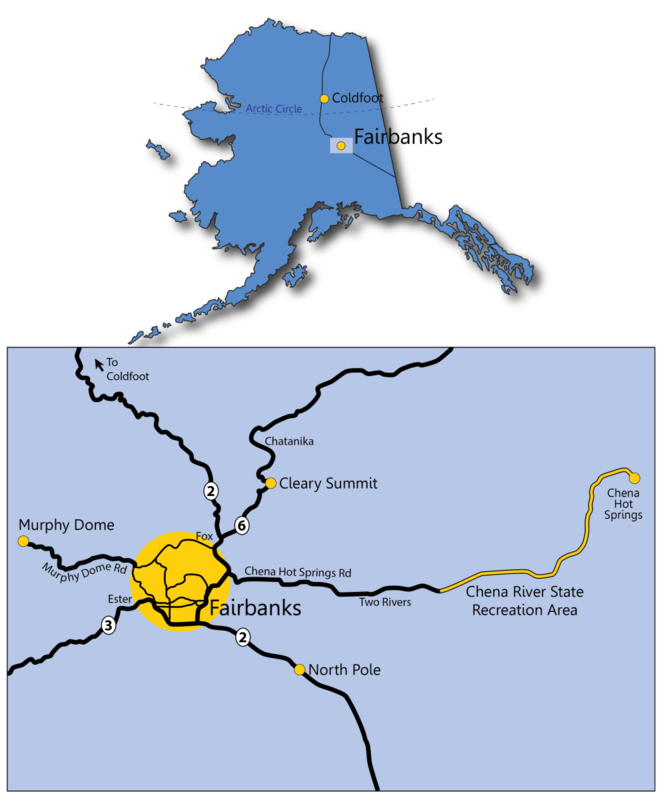 Murphy Dome is the highest point close to Fairbanks at 2,877 ft/877 m and is located 25 miles/40 km from Fairbanks. You will find an accessible high viewpoint but there are some sharp turns as well as major elevation changes and in snowy conditions, an all-wheel or 4-wheel drive vehicle is recommended. 260 miles/418 km from Fairbanks via the Elliot and Dalton highways, Coldfoot is a tiny wilderness community. It is recommended visitors access Coldfoot via tours as the area is remote, cell service is spotty, the road can be rough, and there are very few services along the way. People often access Coldfoot by air. The road is primarily gravel and most car rental companies prohibit traveling the Dalton Highway. Consider taking a tour and get an experts point of view. Get more information about these locations on our blog. Be resolute and patient as the aurora can be unpredictable. Turn off headlights to minimize light pollution when parked at viewpoints. In snowy conditions, all-wheel or 4-wheel drive vehicles are recommended. 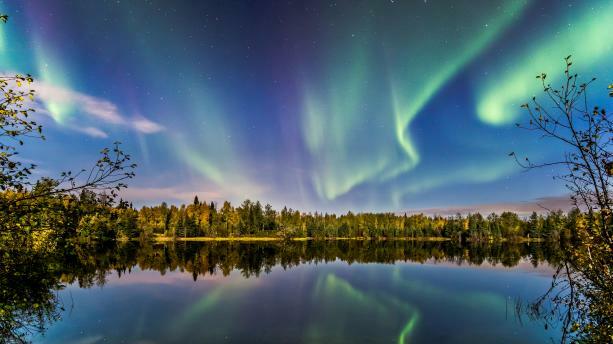 There are many local locations to see the northern lights. 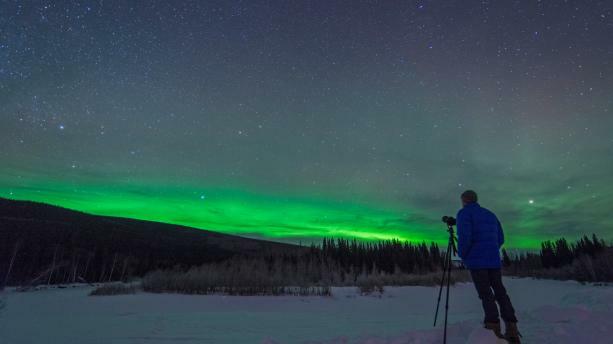 Drive on your own or with a tour to nearby vantage points including North Pole, Cleary Summit, Murphy Dome, Chena River State Recreation Area or up the Dalton Highway all the way to Coldfoot and beyond for excellent aurora viewing opportunities. Arrange a tour to view them from a heated “aurorium” cabin, yurt, dome or lodge, on an overnight sled dog expedition, by snowcat tour, while ice-fishing, on a snowmobile adventure or on a flight above the Arctic Circle. 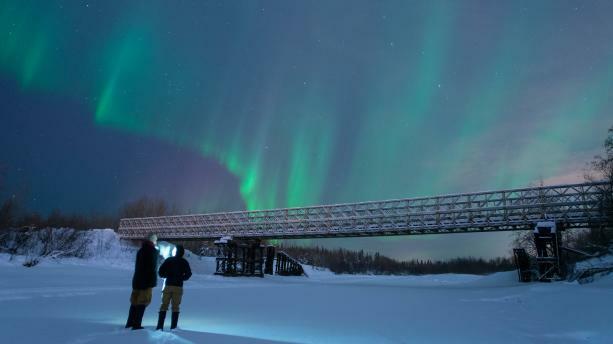 Multiple tours will show you how to take photographs of the northern lights or will take your portrait while the aurora dances in the background. Although the light show will be more vibrant a few miles out of town where it is darker the aurora borealis is visible in and around town too. 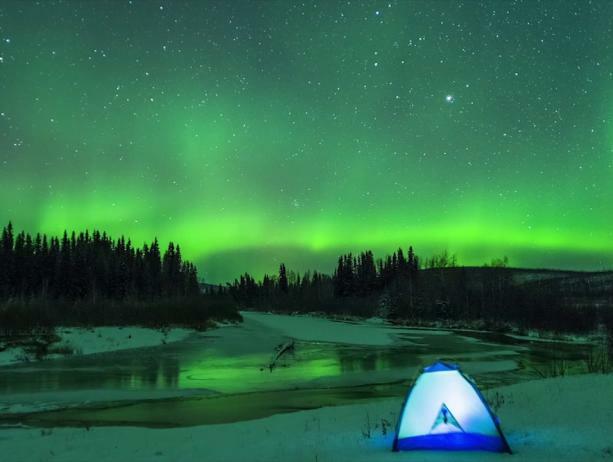 Many accommodations offer wake-up calls when the northern lights are out. Just ask front desk personnel at the time of booking or check-in. 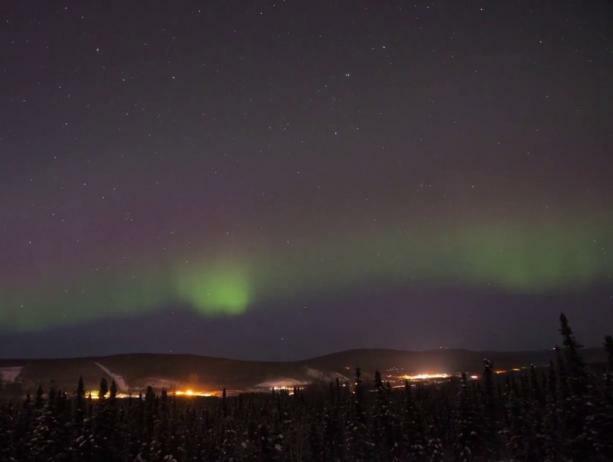 Fairbanks’ location is ideal for northern lights viewing. 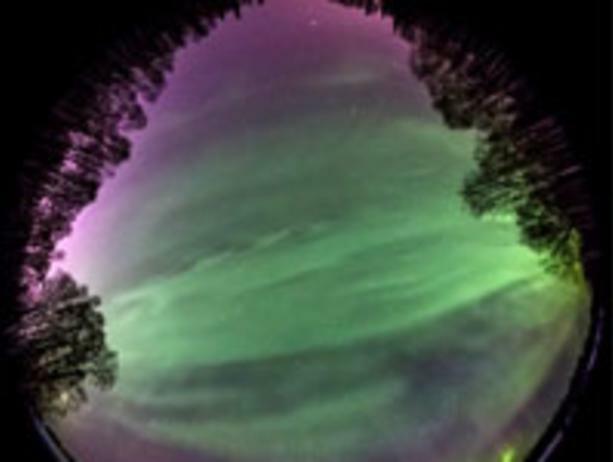 Timelapse of the aurora borealis near Murphy Dome in the Goldstream Valley.